This blanket looks so much better! • First photo is used from Amazon. (I could not get the entire throw in my photo). Saying - “What choice have I?. I cannot be without you, but I will not destroy your soul.”. Original 100 million book mark! 43 countries No.1 debut! The latest hit series enthusiast all over the world! -Japan English dubbed movie and DVD versions, both included! Cast: Kristen Stewart, Robert Pattinson, Taylor Lautner. Necklace is new in sealed packaging. Just like Alice’s from the Twilight Breaking Dawn movie! High Quality from NECA Ages 14 . Like new condition, nice quality canvas tote bag. approx 15", used once. Item is in good condition. Includes hardcover novel with dust jacket. Bought new and displayed in a bookcase. Twilight Lot, books, magazines, posters, lunch box, patches, keychains, pins etc. Condition is Used. Shipped with USPS Parcel Select Ground. Here are 15 of the exclusive Film Cell cards. Each card is individually numbered on back. The cells themselves feature scenes from the film - most of them show one or more of Bella, Edward, Jacob. 50” x 60”. Very nice and soft throw. It was available at Hot Topic and is long sold out. TWILIGHT NECA EDWARD and BELLA Boxed. The Twilight Saga. If I have it - I'll list it for you. This script is from Season 2, Episode 10. This makes original movie scripts very desirable because of how scarce they are. Any changes made to the screenplay during production are known as revisions and these revision pages are inserted into that one script that was issued out to them. We are not responsible for the item after it leaves our hands. brand new in box, never opened 7" Jacob figure. THE TWILIGHT SAGA NEW MOON JACOB & BELLA FIGURINE SET TOYS R US EXCLUSIVE NIP!! 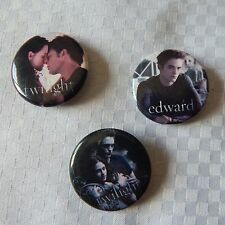 Up for sale is a set of four Twilight Movie Promotional Buttons in used but good condition from NECA. Item ships within 24 to 48 hours after payment has been received and ships via first class mail. Item comes from a smoke free home. Feel free to contact me with any other questions. Thanks! Twilight New Moon "Jacob" Chunky Charm Bracelet New. Condition is New. Shipped with USPS First Class Package. Twilight New Moon "Jacob" Chunky Charm Bracelet Description Product description Twilight New Moon "Jacob" Chunky Charm Bracelet From the Manufacturer Twilight New Moon "Jacob" Chunky Charm Bracelet. Inspired by New Moon the movie and features characters from the Twilight Saga. It is a great gift and highly collectible. It is of great quality by NECA. Features Make sure this fits. by entering your model number. 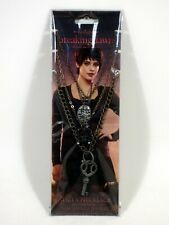 Inspired by New Moon the movie Features characters from the Twilight Saga Great gift Highly collectible Great quality by NECA I combine shipping. Twilight new moon lunch box. scratches on the Edward side only. All four books. Pretty good condition. Vintage 2010 LIFE STORY'S FILM FANTASY- NEW MOON! In very good condition. Shows slight wear and scuffs. Never read. See ALL 6 photos candy long expired, sold as collectible only factory sealed complete set of 3, Bella, Edward & Jacob, exactly as pictured (use magnifying tool). This is a new in sealed box jigsaw puzzle from NECA. It is of the character JACOB from the Twilight movie saga. This is an 1000 pc puzzle. Finished size is 20" x 27". Box is in excellent condition. NEW THE TWILIGHT SAGE BREAKING DAWN PART 1 MOVIE PROMO CUP 44 OZ. FEATURES EDWARD, BELLA, JACOB AND THE CAST. Twilight Saga Breaking Dawn Part 1 - Movie Theater Cup from 11-18-2011 - RARE! Cup was given out in the movie theaters the day that the movie was released. Has been in storage since then, unused. Looks fantastic! Very rare Twilight item. Feel free to message me with any questions. Get this collectible throw to make your friends' blood run cold with envy! Use this throw to cuddle up next to a friend while watching a movie, or to keep warm while reading. 100% polyester; machine washable.